It has been a real challenge to keep things going online this week and last. Although we are located in a large metropolitan area, we are a bit off the grid. We are far enough from the nearest electric substation that we have power issues. Bad weather or someone in the area hitting a pole can send the electricity surging on and off which can kill sensitive electronic equipment. So I have been powered down a lot as storms have rolled through daily here. We discovered early on as house rabbit owners that lights out and roaming rabbits are also a tricky sensitive mix. Trying to navigate a dark room safely without knowing where the rabbits are is not good, not good at all. We stocked up on both flashlights and batteries. We have a flashlight and sometimes two in every room of the house, so that we can reach one quickly. Usually they are close enough to grab without standing up. We don’t want to be moving around much in the dark and possibly stepping on or tripping on a bunny. Shadow would be particularly vulnerable since his deep coloring makes him disappear at times even in good lighting conditions. As soon as we lay hands on a flashlight, we use treats to quickly get Tigger and Shadow into their cages. We have found it to be a good thing to get them safely locked in, because sometimes when the lights come back on they go on and off again a few times before they stay on. This can be really disturbing for the rabbits and we don’t want them to go running off in a panic that could cause them to injure themselves. Also, we are in the warm south where it is customary to have air conditioning running much of the year. The rabbits are not used to the outdoor noises they hear when the windows are open and are more easily startled by the unfamiliar sounds. Perhaps you don’t experience power issues to the extent we do. 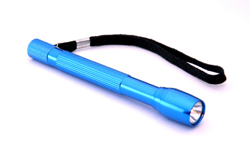 However, if you do from time to time, flashlights are relatively inexpensive. You can buy small ones in packs and keep them handy. One thing we have seen time and again with our rabbits is that they don’t understand that we can’t see them in the dark. When we grab a flashlight and turn it on, we will usually find they have come from wherever they were and are now beside us. They seek us for reassurance, not realizing that we don’t know they are there. Although rabbits like to be mysterious creatures and behave unexpectedly, they crave for their living environment to stay pretty stable and predictable. So if you are new to rabbits, you may want to think about what conditions tend to hit your area in regard to storms and such that disrupt things and have some plans in mind for keeping rabbits safe and sound. This is one reason it is good to have a cage or enclosure that can close them safely in, even if you intend for yours to be free roam. Sometimes for their own safety, it is good for a time to be able to get them quickly to a safe and secure location until a dangerous or scary situation has passed. I’ll share a Follow Friday suggestion later today. This entry was posted in Rabbit Care and tagged animal, bunnies, bunny, flashlights, hare, house rabbits, postaday2011, power outages, protection, rabbit, rabbits, safety, storms by Rabbittude. Bookmark the permalink.